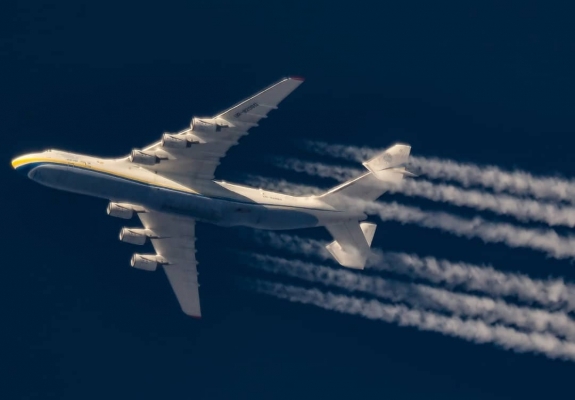 Looking like a jumbo-jet on steroids, the first sight of the Antonov An-225 Mriya (“Dream”) in flight is startling: not four but six engines, a unique twin tail, and much larger than any plane flying today. This is a record-breaking, one-of-a-kind plane in the following categories: heaviest plane ever built, longest wingspan, and has lifted the heaviest single-item payload, and heaviest total payload. This plane was first used for transporting the Soviet Buran space shuttle and has since entered commercial cargo service. A partially-built second air-frame exists and the project to complete it has been revived and cancelled many times. So, someday a second Mriya will take to the skies. Korean Air KAL938 by Instagram user Krzysztof Migo. Copyright Krzysztof Migo. Used by permission. 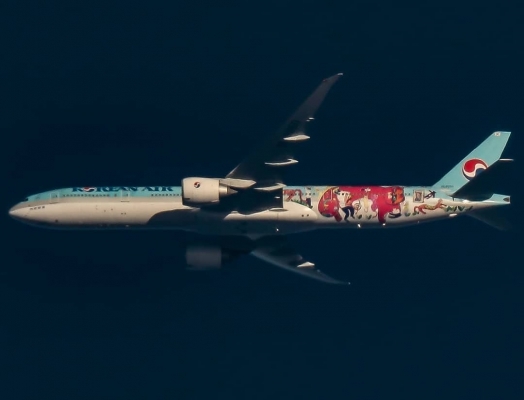 Korean Air flight KAL938 (Vienna to Seoul) is a Boeing 777-3B5(ER) (tail #HL8250) painted with the winning image of the 2016 Korean Air Children’s Drawing Contest. Imaged using a Newtonian 200/1000 (f/5) scope with Tele Vue 2x Powermate™ and Canon 700D / Rebel T5i (18.0 megapixel) DSLR camera. Shot at cruising altitude (30,000+ feet). 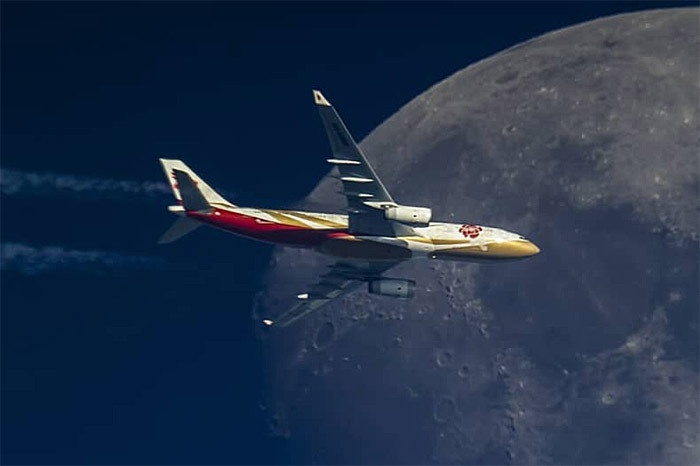 Algierian Air Force Moscow-Alger FL280 by Instagram user Rafał Pruszkowski. Copyright Rafał Pruszkowski. Used by permission. 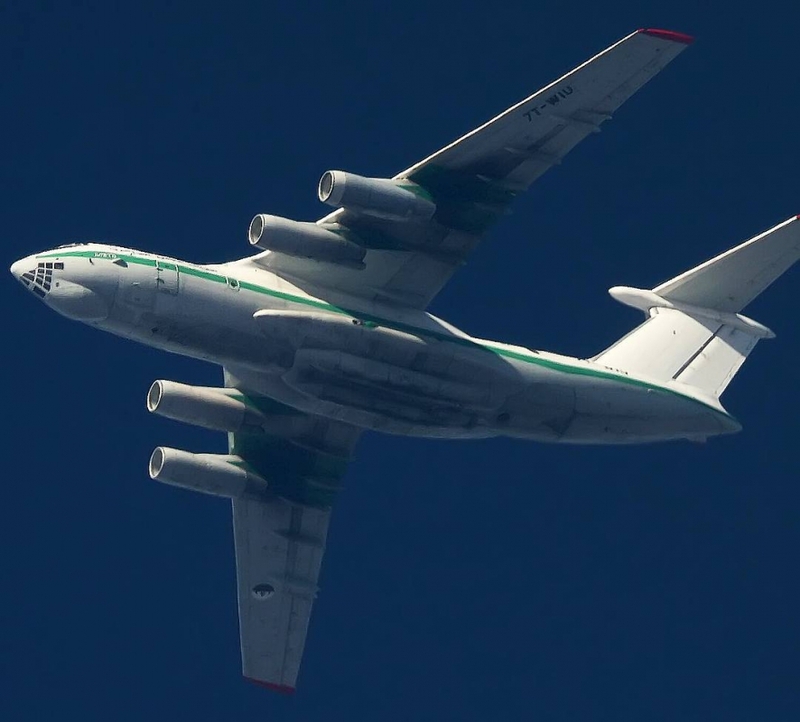 Algerian Air Force Ilyushin Il-76 on flight from Moscow to Alger imaged with Newtonian 8”, 1200-mm scope using Tele Vue 2x Powermate™ and Canon EOS 40D (10.1-megapixel) DSLR. Powermate™ image amplifiers have features beyond that offered by the common Barlow lenses: they amplify scope focal length with reduced aberrations for better image quality. 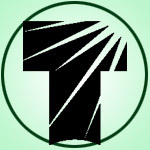 They are available in 2″ barrels (2x & 4x power) and 1¼” barrels (2.5x & 5x power). 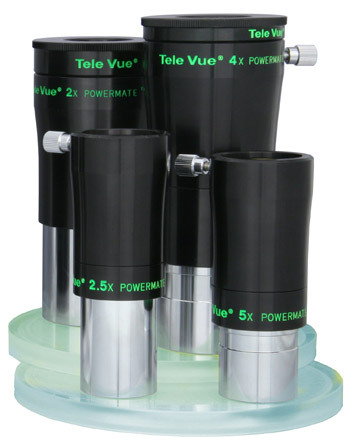 Another Powermate feature is that the tops unscrew to accept the Tele Vue Powermate™ T-Ring Adapter. This allows any T-Ring equipped camera to solidly connect to the Powermate barrel. Shown above are Adapters for 4x (PTR-4201), 1.25″ 2.5x & 5x (PTR-1250) and 2x (PTR-2200). A common telescopic setup is a Newtonian scope with 8″/200-mm diameter mirror having a 1,000- to 1,200-mm focal length. 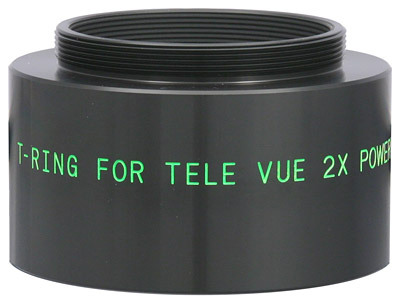 With a 2x Tele Vue Powermate™ inserted in the focuser, the telescope focal length doubles. To understand the zoom level achieved, consider that an APS-format digital camera, attached to these 2,000 – to 2,400-mm focal length instruments, will have a horizontal frame slightly larger than the Moon. A full-frame camera would capture the whole Moon in the frame. Focusing is done on the plane and the shutter manually triggered. The result is an optical setup that turns a sky-high glint into an airliner — complete with artwork and perhaps registration number visible. See Łukasz Żak’s image of extreme plane spotters in action with these scopes. 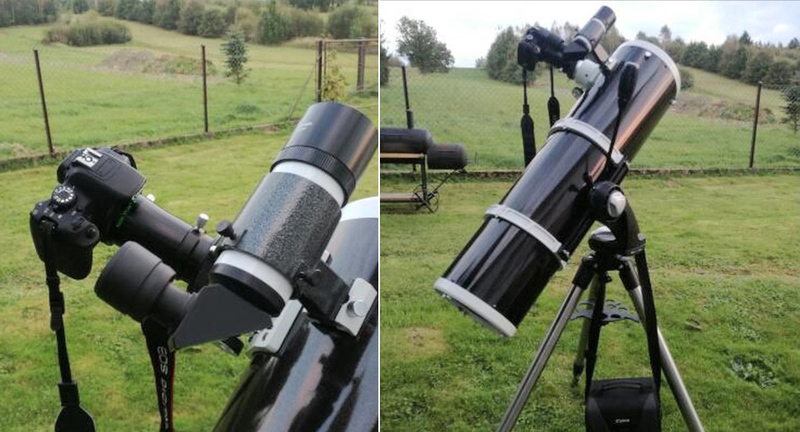 Krzysztof Migo photographs planes from his garden using a Newtonian telescope with 200-mm diameter and 1,000-mm focal length mirror (f/5) that is pointed around the sky with an alt-azimuth mount. 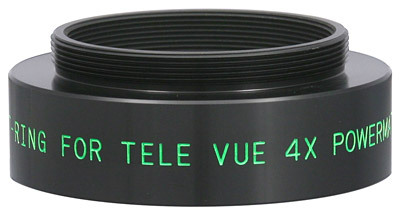 The scope is fitted with a Tele Vue 2x Powermate™ to extend the focal length to 2,000-mm (f/10). A Canon EOS 700D / Rebel T5i (18.0 megapixel) DSLR is attached to the Powermate™ for imaging. After manually focusing, he takes 10-to-15 images in RAW format. Copyright Krzysztof Migo and used by permission. Another possibility we’d like to recommend, for those without a removable lens camera, is to use our FoneMate™ smartphone adapter on a compatible Tele Vue eyepiece inserted into the telescope. Your smartphone camera-app then displays the image on the screen. Just hit the virtual shutter or video record button to capture the moment. Today Alitalia Rome – Tokyo FL340 by Instagram user Rafał Pruszkowski. Copyright Rafał Pruszkowski. Used by permission. 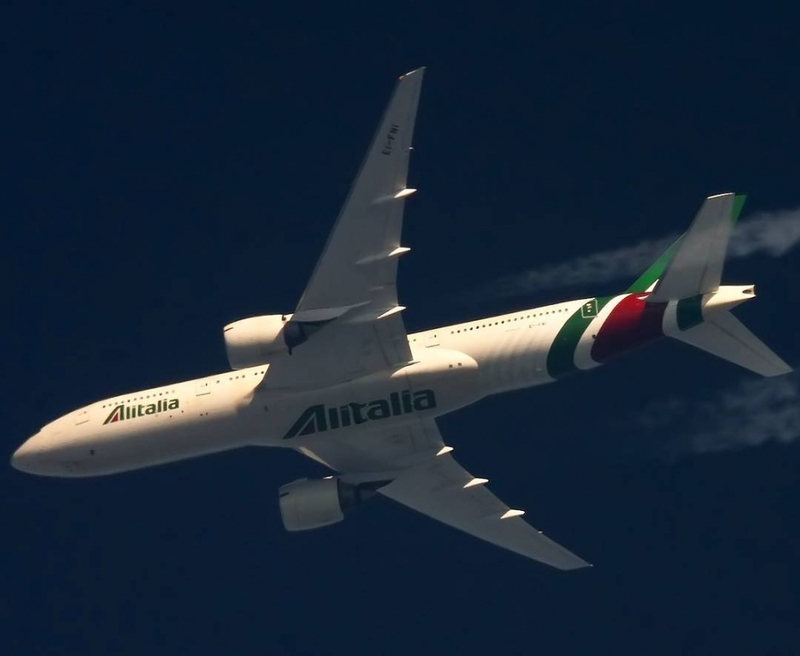 Alitalia’s Rome to Tokyo (flight 340) on a Boeing777. Taken with Newtonian 8″, 1200-mm scope using Tele Vue 2x Powermate and Canon EOS 50D (15.1-megapixel) DSLR. Flight tracking websites FlightRadar 24 and FlightAware are a good starting place for plane spotters. Previous Previous post: Al’s Busy Fall Schedule!